The Kentucky Energy and Environment Cabinet (EEC) has filed a petition for reconsideration with the federal Environmental Protect Agency (EPA) regarding the EPAs final 111(d) rule, the reduction of carbon emissions by existing power plants. In the letter to EPA Administrator Gina McCarthy, EEC Secretary Charles G. Snavely said the final rule differed greatly from the proposed rule on which Kentucky and other states were asked to comment. 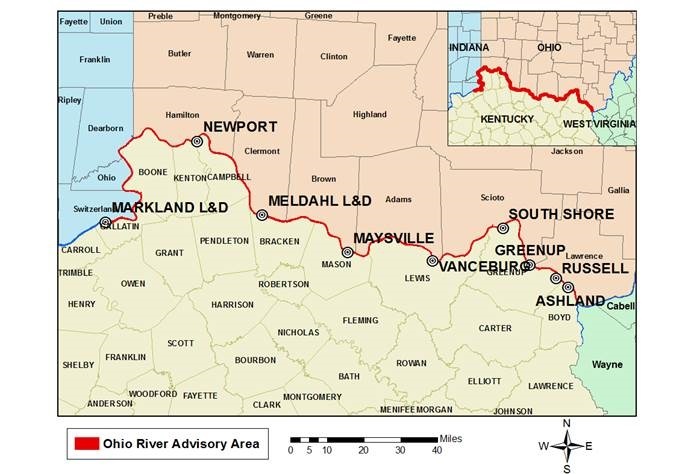 The Kentucky Division of Water (KDOW) and the Kentucky Department for Public Health (KDPH) are re-issuing a harmful algal bloom (HAB) recreational advisory for the Ohio River, extending the advisory downstream from the West Virginia state line to the Markland Dam located 3.5 miles downstream from Warsaw, Ky. This holiday weekend, many Kentuckians will flock to one of the many rivers, lakes and creeks across the state to boat, fish, swim, canoe or otherwise enjoy the water. The Kentucky Division of Water (DOW) and the Kentucky Department for Public Health (DPH) offer these safety tips to help you safely enjoy Kentucky’s abundant water resources. The Kentucky Pollution Prevention Center, Advantage Kentucky Alliance and Kentucky Division of Compliance Assistance are co-hosting a workshop designed to help Kentucky manufacturers. To be competitive in today’s global marketplace, businesses must look at their processes critically to ensure that they are efficient, innovative and sustainable. This workshop will focus on helping manufacturers advance efforts to use lean, clean and energy-efficient practices to conserve energy, reduce environmental impacts, preserve jobs and enhance overall competitiveness. See our agenda. To promote lean, clean and sustainable business practices in Kentucky, one no-cost facility assessment will be awarded to a qualified attendee of this workshop. See the required qualifications to apply for the assessment award. The workshop will be held on Tuesday, June 16, 2015, from 9 a.m.-1:30 p.m. EDT at the DEP Training Center at 300 Fair Oaks Lane, Frankfort, KY 40601. Admission: General $15; KY EXCEL members $10. This fee includes light continental breakfast and lunch. To register, visit http://dca.ticketleap.com/. You must register by June 11. Workshop sponsored by Kentucky Pollution Prevention Center, Advantage Kentucky Alliance and the Kentucky Division of Compliance Assistance. Kentuckians can now find out if their favorite spot on the water is safe to swim or if the fish there are healthy enough to eat with a few clicks of the mouse. The Kentucky Department for Environmental Protection (DEP) has selected the student winners of the 2015 Eco-Art Contest. The annual contest is open to high school students who create artwork in the categories of conservation, pollution prevention and environmental protection through the mediums of media drawing, painting, or print; mixed media; sculpture and photographs.